Utilizing Bally's patented SmartSpeed technology, customers can now benefit from reduced energy consumption and reduced system refrigerant charges, previously only available with more complex and expensive methods. SmartSpeed offers a simplified, economical solution in order to meet the increasingly stringent efficiency levels being mandated across North America. The innovative feature behind the SmartSpeed technology is a two speed EC fan motor that changes speed according to system operation and ambient conditions. On evaporators, the motor speed reduces to low speed when the compressor cycles off, saving energy without sacrificing product integrity. On condensing units, the motor speed reduces to low speed when ambient conditions drop below 60°F, saving energy and refrigerant. Adding SmartSpeed means system-wide savings, regardless of which option you choose. 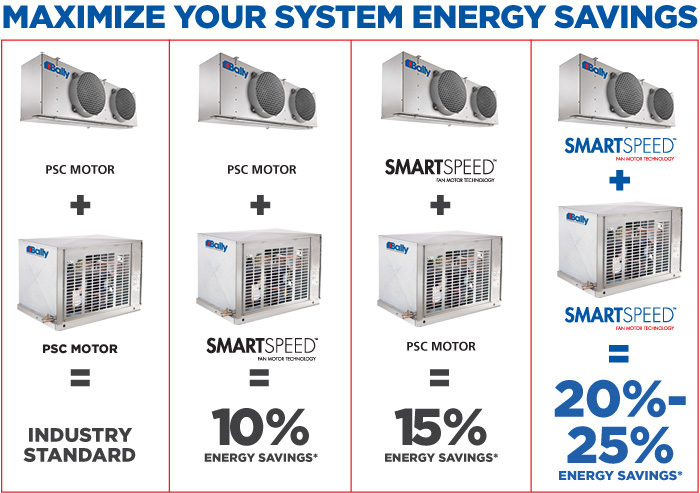 Add SmartSpeed to the condensing unit, and save up to 10% on your system energy consumption. SmartSpeed on the evaporator can mean savings up to 15%. Put SmartSpeed on both and you get the ultimate savings: up to 25%. SmartSpeed units feature simplified wiring which does not require any additional complex controls, and is easy to operate. SmartSpeed is patented under U.S. patents 8,635,883 & 9,151,525. SmartSpeed for Evaporators received an Honorable Mention from the 2010 AHR Expo Innovation Awards. SmartSpeed technology is now available for the first time on Condensing Units. * Actual energy savings will vary due to application, load calculation assumptions, equipment sizing and other operational variables. HOW MUCH CAN SMARTSPEED SAVE YOU? Use our handy Energy Savings Calculator to find out.